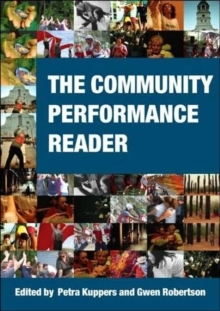 25 cm xviii, 283 p. : ill.
"Community Performance: A Reader" is the first book to provide comprehensive teaching materials for this significant part of the theatre studies curriculum. It brings together core writings and critical approaches to community performance work, presenting practices in the UK, US, Australia and beyond. Offering a comprehensive anthology of key writings in the vibrant field of community performance, spanning dance, theatre and visual practices, the "Reader" uniquely combines classic writings from major theorists and practitioners such as Augusto Boal, Paolo Freire, Dwight Conquergood and Jan Cohen Cruz, with newly commissioned essays that bring the anthology right up to date with current practice. This book can be used as a stand-alone text, or together with its companion volume, "Community Performance: An Introduction," to offer an accessible and classroom-friendly introduction to the field of community performance.